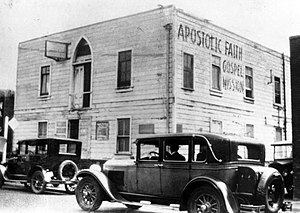 "Apostolic Faith Mission" kwenye Azusa Street inahesabiwa kuwa chanzo cha tapo la Kipentekoste. Waumini wa Pentecostal Church of God huko Lejunior, Kentucky, Marekani wakimuombea msichana mwaka 1946. Wapentekoste ni jina linalojumuisha Wakristo wanaofuata tapo la Kipentekoste linalolenga kuleta upyaisho katika Kanisa kwa kutia maanani tukio la sikukuu ya Pentekoste ya mwaka uleule wa kifo na ufufuko wa Yesu. Tapo hilo linaungana na Waprotestanti wengine katika kushikilia Biblia ya Kikristo tu na kwa njia yake kumkiri Yesu kuwa Bwana na kumpokea kama mwokozi, lakini pia linasisitiza mang'amuzi binafsi ya Roho Mtakatifu katika maisha ya muumini kama yalivyotokea mwanzoni kadiri ya Matendo ya Mitume ili kuwezeshwa kuishi Kikristo kweli kwa upako wa Roho. Kwa kuwa wanajitangaza "wameokoka", yaani wameachana na dhambi, kwa Kiswahili wanaitwa pia "Walokole". Tangu tapo hilo lilipoanza mwaka 1907 huko Marekani, Wapentekoste wameshakuwa zaidi ya milioni 279, mbali ya Wakristo wa madhehebu ya zamani walioathiriwa nalo ambao wanaitwa mara nyingi Wakarismatiki na ambao idadi yao inalingana na hiyo. Blumhofer, Edith L. Pentecost in My Soul:Explorations in the Meaning of Pentecostal Experience in the Early Assemblies of God. Springfield, Missouri:Gospel Publishing House, 1989. ISBN 0-88243-646-5. Blumhofer, Edith L. The Assemblies of God:A Chapter in the Story of America Pentecostalism, Volume 1—To 1941. Springfield, Missouri:Gospel Publishing House, 1989.ISBN 0-88243-457-8. Blumhofer, Edith L. Restoring the Faith: The Assemblies of God, Pentecostalism, and American Culture. Urbana and Chicago: University of Illinois Press, 1993. ISBN 978-0-252-06281-0. Burgess, Stanley M., and Eduard M. van der Maas, eds. The New International Dictionary of Pentecostal and Charismatic Movements. Grand Rapids: Zondervan, 2002. Dayton, Donald W. "Theological Roots of Pentecostalism". Pneuma: The Journal of the Society for Pentecostal Studies 2, no. 1 (Fall 1980): 3-21. Duffield, Guy P. and Nathaniel M. Van Cleave. Foundations of Pentecostal Theology. Los Angeles: Foursquare Media, 2008 (originally published 1983). ISBN 978-1-59979-3368. Evans, Mark. Open Up the Doors: Music in the Modern Church. London: Equinox Publishing Ltd., 2006. ISBN 978-1-84553187-4. Gee, Donald. Concerning Spiritual Gifts. Springfield, Missouri: Gospel Publishing House. ISBN 0-88243-486-1. Graves, Jr., Wilfred. In Pursuit of Wholeness: Experiencing God's Salvation for the Total Person. Shippensburg, PA: Destiny Image Publishers, Inc., 2011. ISBN 978-0-7684-3794-2. Horton, Stanley M., ed. Systematic Theology, rev. ed. Springfield, Missouri: Logion Press/Gospel Publishing House, 1994. ISBN 978-0882438559. Horton, Stanley M. What the Bible Says about the Holy Spirit, rev. ed. Springfield, Missouri: Gospel Publishing House, 2005. ISBN 0-88243-359-8. Knox, Ronald. Enthusiasm: a Chapter in the History of Religion, with Special Reference to the XVII and XVIII Centuries. Oxford, Eng. : Oxford University Press, 1950. viii, 622 p.*Macchia, Frank D. "God Present in a Confused Situation: The Mixed Influence of the Charismatic Movement on Classical Pentecostalism in the United States". Pneuma: The Journal of the Society for Pentecostal Studies 18, no. 1 (Spring 1996): 33-54. Macchia, Frank D. Baptized in the Spirit: A Global Pentecostal Theology. Grand Rapids, Michigan: Zondervan, 2006. ISBN 978-0-310-25236-8. McGee, Gary B. "'Latter Rain' Falling in the East: Early-Twentieth-Century Pentecostalism in India and the Debate over Speaking in Tongues". Church History 68, no. 3 (September 1999): 648-665. Menzies, William W. "The Reformed Roots of Pentecostalism". PentecoStudies 6, no. 2 (2007): 78-99. Patterson, Eric, and Edmund Rybarczyk, eds. The Future of Pentecostalism in the United States. New York: Lexington Books, 2007. ISBN 978-0-7391-2102-3. Poloma, Margaret M. The Assemblies of God at the Crossroads: Charisma and Institutional Dilemmas. Knoxville, Tennessee: The University of Tennessee Press, 1989. ISBN 0-87049-607-7. Poloma, Margaret M. and John C. Green. The Assemblies of God: Godly Love and the Revitalization of American Pentecostalism. New York: New York University Press, 2010. Robeck, Jr., Cecil M. "Written Prophecies: A Question of Authority". Pneuma: The Journal of the Society for Pentecostal Studies 2, no. 1 (Fall 1980): 26-45. Robeck, Cecil M. "An Emerging Magisterium? The Case of the Assemblies of God". Pneuma: The Journal of the Society for Pentecostal Studies 25, no. 2 (Fall 2003): 164-215. Robeck, Jr., Cecil M. The Azusa Street Mission and Revival: The Birth of the Global Pentecostal Movement. Nashville: Thomas Nelson, Inc., 2006. Synan, Vinson. "Pentecostalism: Varieties and Contributions". Pneuma: The Journal of the Society for Pentecostal Studies 9 (Fall 1987): 31-49. Synan, Vinson. The Holiness–Pentecostal Tradition: Charismatic Movements in the Twentieth Century. Grand Rapids, Michigan: William B. Eerdmans Publishing Company, 1997. ISBN 978-0-8028-4103-2. Wacker, Grant. 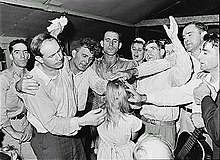 Heaven Below: Earlier Pentecostals and American Culture. Harvard University Press. 2001. Brewster, P.S. Pentecostal Doctrine. Grenehurst Press, United Kingdom, May 1976. ISBN 978-0905857008. Je, unajua kitu kuhusu Wapentekoste kama historia yake, matokeo au athari zake? Ukurasa huu umebadilishwa kwa mara ya mwisho tarehe 17 Agosti 2014, saa 13:00.